It's become an accidental tradition that on my good friend's birthdays, I bake them an awesome cake. As I was unable to find a simple guide to my liking for working with fondant, I've decided to write my own. 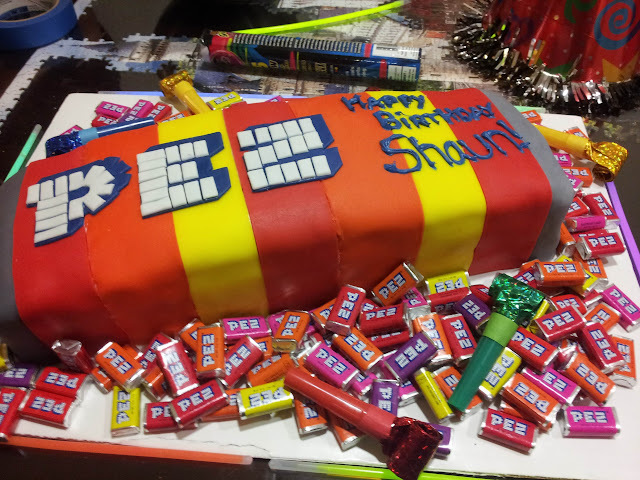 I dyed the fondant, baked the cake, and assembled & decorated it across three days, spending a total of about 12 hours. 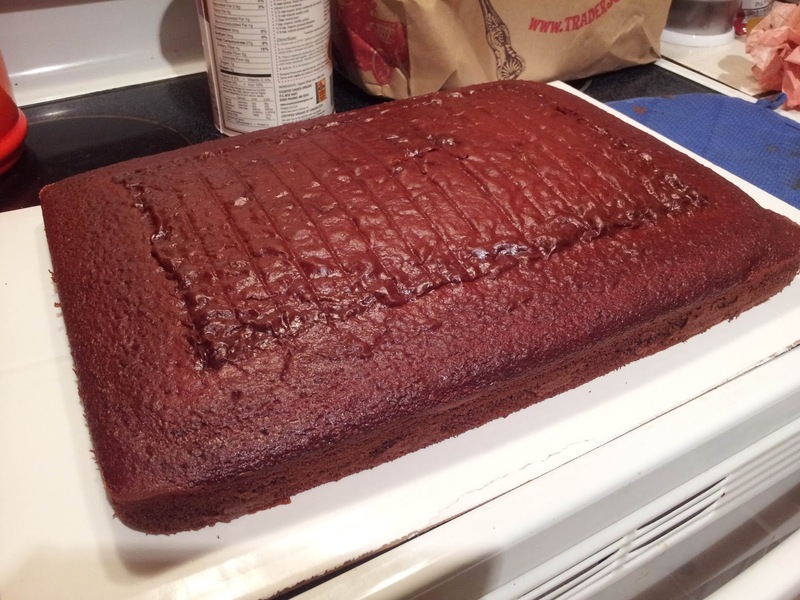 This is the second post of the series, where I outline a few of my baking tricks and how to assemble a multi-layer cake. This is honestly the most straight forward post of the series, mainly because I just baked a box cake. I applied a few baking tricks along the way, though, and conveying those are the real goal of this post. Baking Trick #1 Line the bottom of your cake pan with parchment paper. You want the paper to fit as best as you can, so you might want to trace the bottom of the pan and cut it out exactly. Then, grease the sides of the pan with either butter or Crisco. 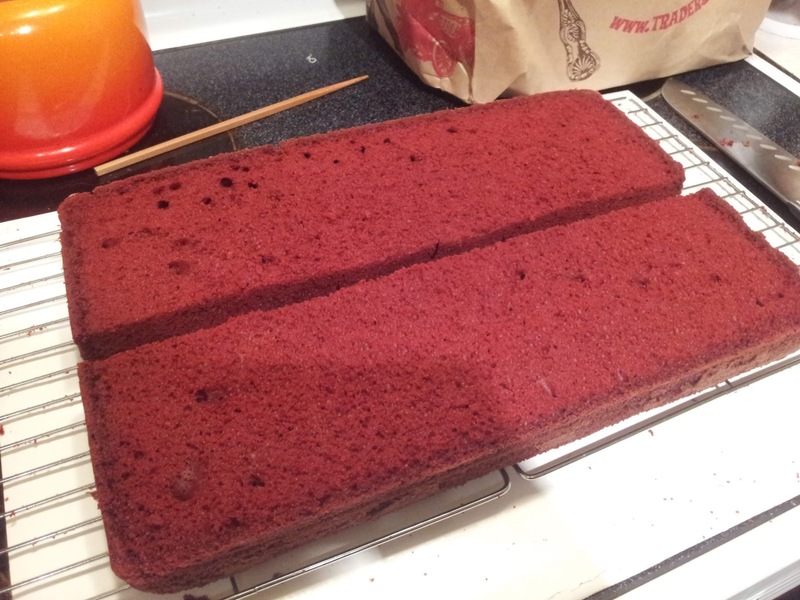 When you flip the cake out of the pan, the bottom will come out perfectly. For the cake itself, I really just whipped up the batter as the instructions on the box said, mixing the two boxes together. Preheated my oven and baked until the toothpick (read: chopstick) test came back clean. Pulled the cake out, flipped it out of the pan, then let cool completely. Baking Trick #2 Let the cake cool completely! Before you cut it, decorate it, or eat it, let it cool completely! This could take up to an hour or more. You can cheat and stick it in the fridge, but in general, should just be patient and let it cool! Letting it cool on racks will help speed up the process, and I always recommend letting it cool "face up." Baking Trick #3 Get a cake leveler. 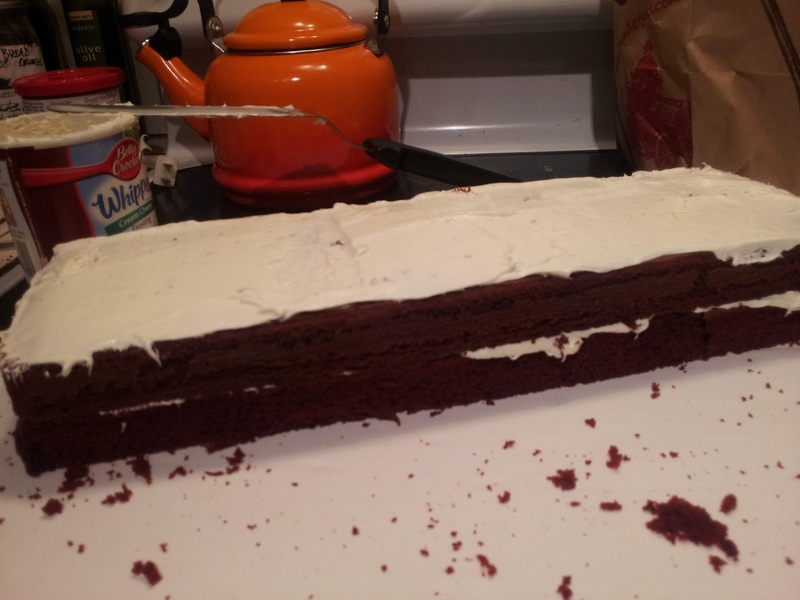 If you're planning on making more than one multi-level cake in your lifetime, get a leveler. They're cheap, don't take up a lot of space, and they help you make gorgeous cakes. Always make sure you level your cake after it's cooled completely to the touch. 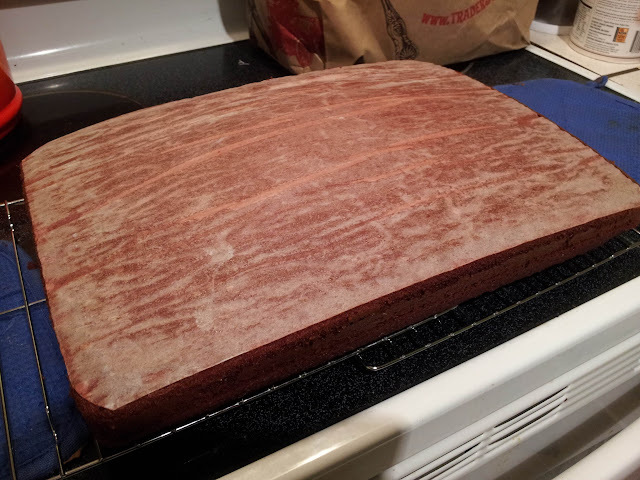 Once you cut off the top layer, you might find that the inside is still a bit warm. Guess what? Let it cool more after you find that out! 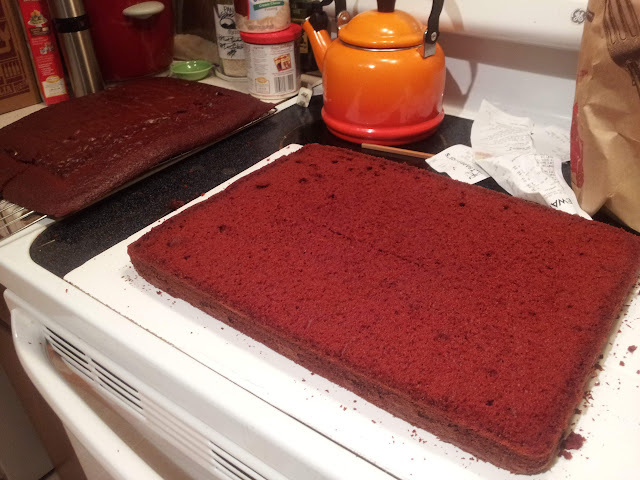 Once you've let the cake cooled completely and leveled it, you can start cutting and building the layers. 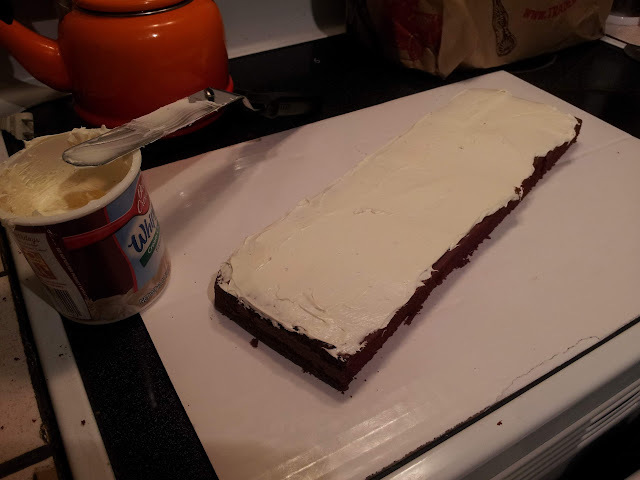 I managed to get two complete layers from my 11x15 sheet cake, and then constructed a 3rd layer from the top of the cake that I originally trimmed off. You wanna frost well between each layer of the cake, and I find that letting the cake chill between layers helps the stability a bit moving forward. I splurged the 6 bucks and bought a 12 pack of cake boards. They're great for construction and presentation, as they're sturdy and easily wiped down. 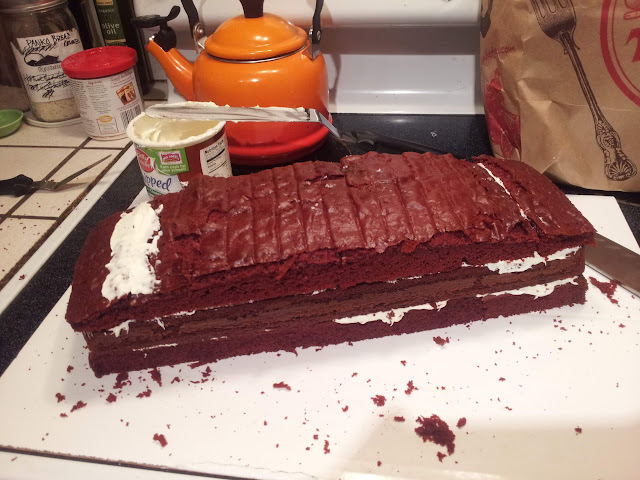 Originally I was planning on just a double layer cake, but once I put the layer together, I decided we would need more cake for the party. So I went ahead and pieced together a third layer from the top piece that I had shaved off with the leveler. 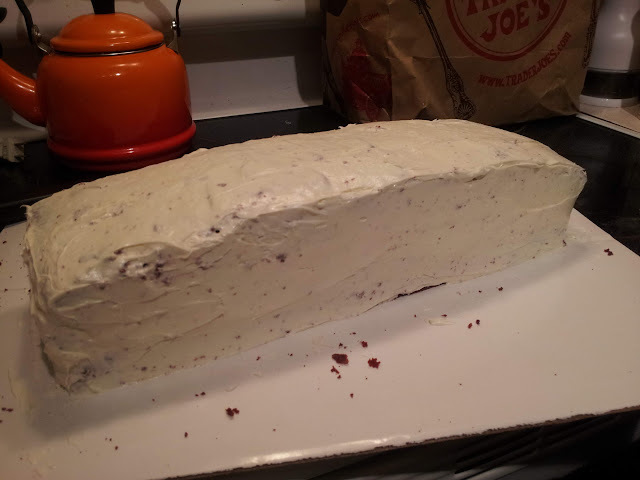 I used frosting like glue and while it isn't pretty now.. no one ever suspected a thing once I frosted the whole cake. See? Can't tell a thing. Notice that I didn't worry about getting cake bits in the frosting. I knew that I was going to be covering the whole thing with fondant, so I knew that the frosting didn't need to be perfect. Remember to be generous with the frosting and cover your cake entirely! Frosting air seals the cake and keeps it fresh! Fondant isn't an air tight seal and won't help keep your cake fresh. 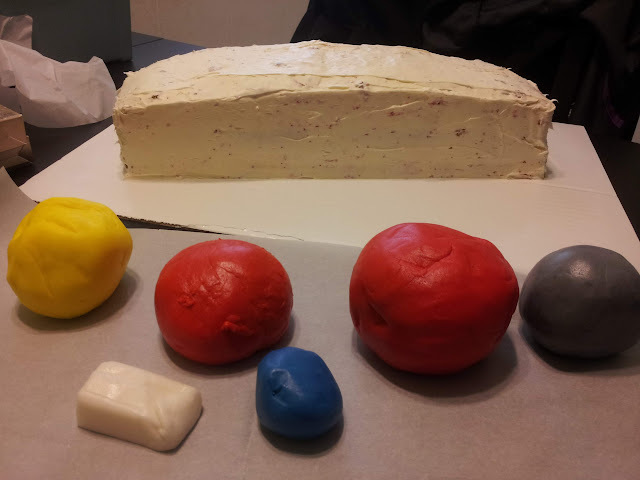 The next and last post will outline how to put your fondant on the cake. Dun dun DUN!